Capital One Financial Corp was started in 1988 by Richard Fairbank and Morris Nigel. Headquartered in McLean, Virginia, the bank operates branches in New York, Texas, Maryland, the District of Columbia, New Jersey, and Louisiana. It offers a range of financial products and services to individuals, small businessesSmall Cap StockA small cap stock is a stock of a publicly traded company whose market capitalization ranges from $300 million to approximately $2 billion. The classification between small, mid, and large-cap companies is subjective and can vary among brokerages and market analysts., and large commercial clients.Market CapitalizationMarket Capitalization (Market Cap) is the most recent market value of a company’s outstanding shares. Market Cap is equal to the current share price multiplied by the number of shares outstanding. The investing community often uses the market capitalization value to rank companies It specializes in auto loans, credit cards, banking, and saving products. As at 2016, the company employed 47,300 people in its 755 branches and operated over 200 ATMs in United States, Canada, and the United Kingdom. Capital One ranks eighth among the 10 largest banks in the United States based on assets and deposits, and tenth on the list of the biggest banks by total assets. Fortune 500 ranks the bank 17th on the Fortune 500’s list of the best companies to work for and 100th on the list of Fortune 500 companies. Capital One gained popularity in the 1990’s when it pioneered the mass marketing of credit cards in the United States. In 2016, the credit card business accounted for 62% of its annual revenue, while 25% came from consumer banking, 11% from commercial banking, and 1% in other sources. Richard Fairbank and Nigel Morris founded Capital One in 1988 with the support of Richmond, Virginia-based Signet Bank. Fairbank became the company’s CEO on July 27, 1994, after Oakstone Financial was spun off from Signet Financial Corp. Oakstone Financial was later renamed to Capital One in October 1994, and the spin-off was completed in February 1995. The newly formed credit card company was ranked among the top ten credit card issuers in the United States after signing up more than five million customers. Capital One worked as a monoline, deriving all of its revenues from the credit card business. Even as a monoline, it succeeded in the credit card business due to its use of data collection to target personalized offers directly to consumers. In 1996, Capital One moved from relying on teaser rates to generate new clients to adopting more innovative techniques that would attract more customers to their business model. At the time, it was losing customers to competitors who offered higher ceilings on loan balances and no-annual-fee accounts. The company came up with co-branded, secured, and joint account credit cards. 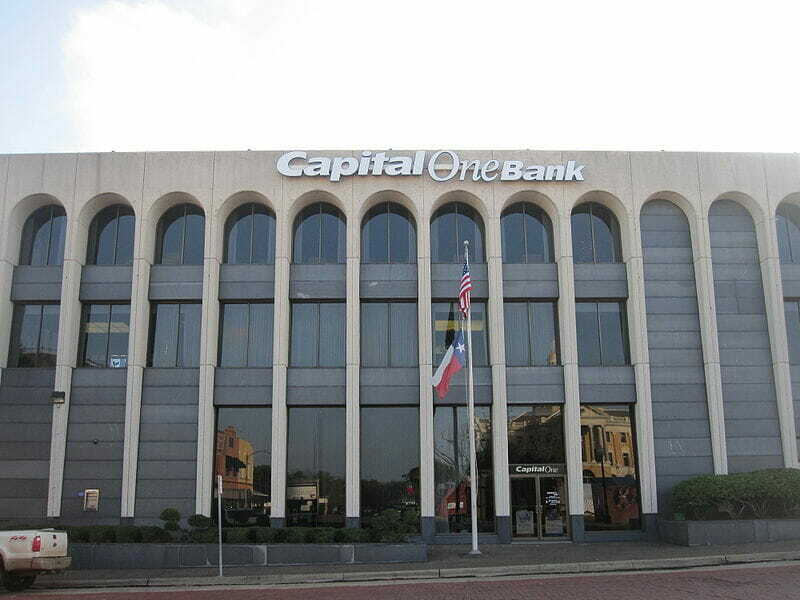 In mid-1996, Capital One received approval from the federal government to set up Capital One FDB. It meant that the company could now retain and lend out deposits on secured cards and even issue automobile installment loans. In 1996, Capital One expanded its business operations to the United Kingdom and Canada. This gave the company access to a large international market for its credit cards. An article appearing in the “Chief Executive” in 1997 noted that the company held $12.6 billion in credit card receivables and served more than nine million customers. The company was listed in the Standard & Poor’s 500, and its stock price hit the $100 mark for the first time in 1998. Throughout its history, Capital One has focused on making acquisitions of monolines in various related sectors. In 2005, the company acquired Louisiana-based Hibernia National Bank for $4.9 billion in cash and stock. It also acquired New York-based North Fork Bank for $13.2 billion in 2006. The acquisition of smaller banks reduced its dependency on the credit business alone. Other companies acquired by Capital One include Netspend for $700 million in 2007, Chevy Chase Bank for $520 in 2009, IDG Direction division for $9 billion in 2011, and General Electric’s Healthcare Financial Services Unit for $9 billion in 2015. During the subprime financial crisis of 2008, Capital One received $3.56 billion in investments from the US Treasury courtesy of the Troubled Asset Relief Program in 2008. The company was forced to close its mortgage division, GreenPoint Mortgage, due to the losses incurred by investors. It paid back $3.67 billion to the US Treasury for the repurchase of the company stock. Capital One started off as a credit card company before diversifying to other business models. It issues credit cards in the United States, United Kingdom, and Canada. As of 2016, it was the third-largest credit card issuer in the United States, with 62.5 million active cardholder accounts, representing 11.13% of the total market share. In December 2016, Capital One reported $97 billion in outstanding credit card loans in the US and $8 billion in the UK and Canada. The company operates Capital One 360, a direct bank that offers regular banking services such as checking accounts, savings accounts, and money market accounts. It is also one of the largest bank auto loan lenders in the US, reporting $48 billion in outstanding auto loans as of December 2016. Apart from auto loans, Capital One was also one of the largest mortgage lenders in the United States before discontinuing the business in November 2017. The commercial division offers an array of services including commercial lending, depository services, capital marketsKey Players in the Capital MarketsIn this article, we provide a general overview of the key players and their respective roles in the capital markets. The capital markets consist of two types of markets: primary and secondary. This guide will provide an overview of all the major companies and careers across the capital markets., treasury management, private bankingPrivate BankingPrivate banking involves providing personalized financial and banking services to high net worth individual clients. The bank assigns specific employees to cater to each banking client's needs. Unlike mass-market retail banking, private banking focuses on providing more personalized financial services and wealth management. As of 2016, Capital One managed $65 billion in outstanding loans by commercial, family, and industrial properties. Private banking, which is part of the commercial banking division, caters to the needs of business owners, executives, and affluent individuals with investable assets of $1 million to $25 million. Born on September 18, 1950, Richard Fairbank is the founder, CEO, and president of Capital One. He founded the financial services company alongside Nigel Morris, a British Businessman and the Managing partner of QED Investors. Fairbank holds a bachelor’s degree in economics from Stanford University (1972) and an MBA from the Stanford Graduate School of Business (1981). He’s received several accolades, including the Washingtonian’s Business Leader of the Year, Worth’s List of Top 10 CEOs and 50 Best CEOs, Gartner Group’s Excellence in Technology, and Credit Card Management’s Entrepreneur of the Year.